Stem: young crown conic; branches +- whorled in young pls, smaller +- drooping; young bark smooth, with resin blisters, mature thick, deep-furrowed, dark brown; twig without persistent, peg-like leaf bases; leaf scars +- smooth, +- elliptic; bud < 15 mm, fusiform. Leaf: persistent < 8 years, 2--4.5 cm, tapered to a short petiole above persistent base, +- spreading, +- flat, with 2 +- white bands abaxially. Seed Cone: pendent, 4--20 cm, maturing 1st year, persistent or not; stalk < 2 cm; bract exserted, 3-toothed or -lobed, free from scale. Seed: plus wing < 25 mm. Stem: trunk < 67 m, < 4.4 m wide; mature crown rounded; upper branches large. Leaf: 2--4 cm. Seed Cone: deciduous; bracts well exserted. Chromosomes: 2n=26. Ecology: Widespread in mixed-evergreen, mixed-conifer forests; Elevation: < 2200 m. Bioregional Distribution: KR, NCoR, CaRH, n&c SNH, CCo, SnFrB, SCoRO; Distribution Outside California: to southwestern British Columbia. Unabridged Note: In Scottish, Menzies pronounced "Mingis," with the "g" spoken as in "singer". 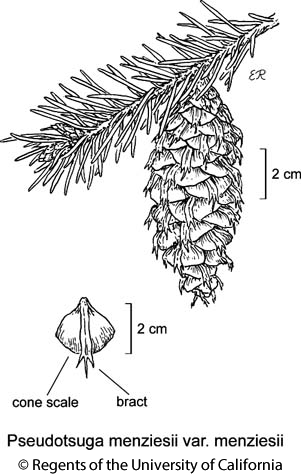 Citation for this treatment: J. Robert Haller, Nancy J. Vivrette, & James R. Griffin 2012, Pseudotsuga menziesii var. menziesii, in Jepson Flora Project (eds.) Jepson eFlora, http://ucjeps.berkeley.edu/eflora/eflora_display.php?tid=64553, accessed on April 25, 2019. KR, NCoR, CaRH, n&c SNH, CCo, SnFrB, SCoRO; Markers link to CCH specimen records. Yellow markers indicate records that may provide evidence for eFlora range revision or may have georeferencing or identification issues. Purple markers indicate specimens collected from a garden, greenhouse, or other non-wild location.